The nominees are evaluated on 20 main quantitative and qualitative criterion: they include disruptive impact, market footprint, proof of concept, financial performance, technology innovation, social value, quality of management, execution of strategy, and integration into their respective industries. 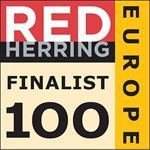 Finalists for the 2015 edition of the Red Herring 100 Europe award are selected based upon their technological innovation, management strength, market size, investor record, customer acquisition, and financial health. Click here for the rest of the finalists. Red Herring is a global media company that unites the world’s best high-technology innovators, venture investors and business decision-makers in a variety of forums, including print, online and exclusive events worldwide. Red Herring provides an insider’s access to the global innovation economy, identifying new and innovative technology companies and entrepreneurs. Its Red Herring 100 awards for North America, Europe, Asia and Global have recognized more than 5,000 companies in their early stages, including Baidu, Google, eBay and Skype. For more information, please go to http://www.redherring.com/events/.